In addition to the excerpts from #147 in this post, please see resources for many more related articles. 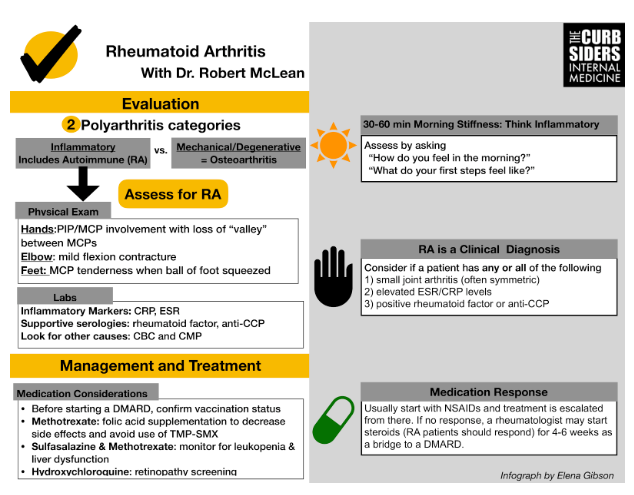 Here is the link to the podcast and show notes for #147 Rheumatoid Arthritis for the Internist, APRIL 8, 2019 By ELENA GIBSON. Consider two polyarthritis categories: inflammatory arthritis vs. mechanical/degenerative arthritis. Evaluate for morning stiffness by asking “How do you feel in the morning?” or “What do your feet feel like in the morning?”. At least 30-60 minutes of morning stiffness points towards an inflammatory arthritis such as rheumatoid arthritis (RA). RA presents in a bimodal distribution: young females and the elderly. Order a CRP and ESR to evaluate for inflammation and look for ESR >30. Avoid ordering cardioselective high-sensitivity CRP. Order a rheumatoid factor and anti-CCP to assess for RA, and look for levels ~3x the upper limit of normal. CBC and CMP can check for other causes of systemic disease. Avoid ordering excessive laboratory tests (e.g., ANA, HLA-B27, ANCA) when not clinically appropriate. Palpate joints for synovial thickening and tenderness. Examine joints for full range of active and passive motion. Patents may have a mild flexion contracture of the elbow. Examine the metatarsophalangeal (MTP) joints for pain by applying pressure to the ball of the foot. RA is a clinical diagnosis! Consider it if a patient has any/all of the following: 1) small joint arthritis (often symmetric) 2) elevated ESR/CRP levels 3) positive rheumatoid factor or anti-CCP. Initial treatment for most patients with RA will be NSAIDs and/or steroids. Treatment will then be escalated to immunomodulators, methotrexate, or biologics (DMARDs). Before a patient starts a biologic agent, administer zoster, pneumonia, flu, hepatitis B and HPV vaccinations. Check hepatitis serologies and TB testing prior to treatment with a TNF inhibitor. Patients on methotrexate require folic acid substitution and monitoring for leukopenia. Avoid combining Trimethoprim-sulfamethoxazole and methotrexate (MTX). This drug interaction increases MTX levels & risk for toxicity. Dr. McLean notes that in the past the diagnosis of rheumatoid arthritis has required 6 weeks of symptoms. The reason, he said, is that there are a fair number of self limited post infectious/autoimmune arthritis – see above. Our goal for Rheumatoid Arthritis is to treat to remission. And Dr. McLean also states the sooner treatment is begun the better the outcome for patient. Therefore, Dr. McLean recommends early referral to the rheumatologist. And the rheumatologist will also evaluate for two other causes of inflammatory arthritis listed below. Dr. McLean observes that a careful complete review of systems should alert you to symptoms that may be due to vasculitis. An excellent history form for this purpose is from the American College of Rheumatology [Resource (2) below]. And see also Resource (3) below for an approach to vasculitis. (1) 2015 American College of Rheumatology Guideline for the Treatment of Rheumatoid Arthritis [PubMed Abstract] [Full Text HTML] [Full Text PDF]. Arthritis Rheumatol. 2016 Jan;68(1):1-26. doi: 10.1002/art.39480. Epub 2015 Nov 6. The above article has been cited by over 100 articles in PubMed Central. (3) Diagnostic approach to patients with suspected vasculitis [Pubmed Abstract] [Full Text HTML] [Full Text PDF]. Postgrad Med J. 2006 Aug; 82(970): 483–488. The above article has been cited by 9 articles in PubMed Central. ARUP Consult® is a laboratory test selection support tool with more than 2,000 lab tests categorized into disease-related topics and algorithms. This entry was posted in Rheumatology. Bookmark the permalink.